"So, the Labyrinth is a piece of cake, is it? Well, let's see how you deal with this little slice..."
There's a meditative, quiet place in San Francisco where you'll find an awesome spiral labyrinth made of rocks and city detritus, lost toys and found objects, sitting in the green grass, ringed by blue gum eucalyptus, cypress, and pine, at the top of a steep hill in McLaren Park. The ridge-top grove is so secluded, and the labyrinth so lovingly detailed, the place feels sacred. 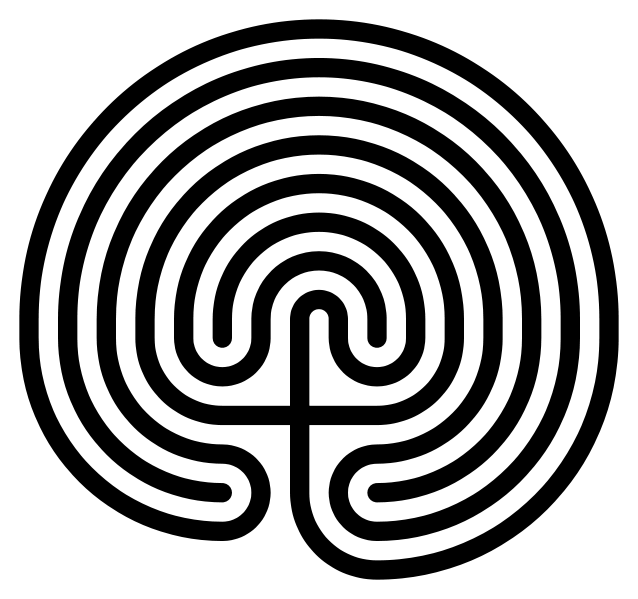 The labyrinth is an ancient symbol, a combination of circle, spiral, and maze. Perhaps the most famous labyrinth is the one from Greek mythology, a vast and complicated puzzle built by the master craftsman, Daedalus, to imprison the Minotaur, a creature half-man, half-bull. Daedalus architected the Labyrinth so well, he almost couldn't get out of it. There are labyrinths in cultures throughout the world, from all different times, more ancient than the Greek myth. It's implied that the theme behind all these labyrinths is their universal spirituality. 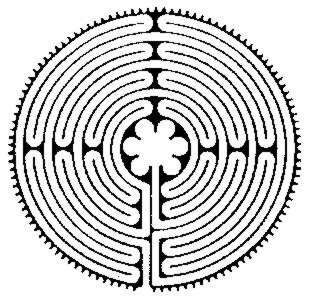 Starhawk, a famous modern witch and activist, wrote in The Earth Path (2004) that a labyrinth "has a single pathway through it...that leads to a center that's a spot for insight and meditation." In the center of McLaren Park's labyrinth is a rough-hewn wooden bench. 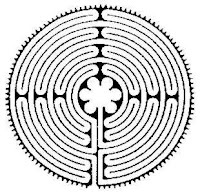 Furthermore, Starhawk says, "There are many forms of the labyrinth, from the classic Minoan seven-path labyrinth to the more complex pattern of the labyrinth found in Chartres cathedral." And so we have the San Francisco labyrinth. You'll find the spiral labyrinth in McLaren Park, in the southeastern quadrant of San Francisco. The labyrinth is at the highest point of the park, on the ridgeline. Go to the large dog-run area, north of Mansell Avenue and in the middle of the loop of John F. Shelley Drive, and head uphill. McLaren Park, by the way, of is one of those rare places that feel almost not a part of the city, with raptors soaring overhead, a wild southern side of steep grasslands, coyotes padding around at dusk, endless secret spots among trees and outcroppings, and three-hundred and sixty degrees worth of views, from the grey, crenellated cityscape, the blue Pacific Ocean, the San Francisco Bay, Mount Diablo, and San Bruno Mountain. I don't really need to say this, but will in the hope of preserving this treasure from vandalism. When you go, add something special. Fix a spot that might've crumbled. Take away something that definitely doesn't belong. Do something, and it'll come back to you, three times as strong. Blessed be. Yes! shhh....best special spot for me. In search of hilltops and wild places. San Bruno Mountain’s Summit Loop Trail: mountain lion and wildflowers! To create a resource of articles about hikes in the San Francisco Bay Area (and on special occasions, hikes in different parts of the world). To connect with people who love wild plants and animals in the midst of a city. To identify hikes for kids that generate enthusiasm, observation, and introspection. Once a month, I lead family-friendly hikes for some old fashioned fun where we go on a two to three hour ramble with a picnic. Free. "Nature is a language. Can't you read?" West of the Moon, East of the Sun."